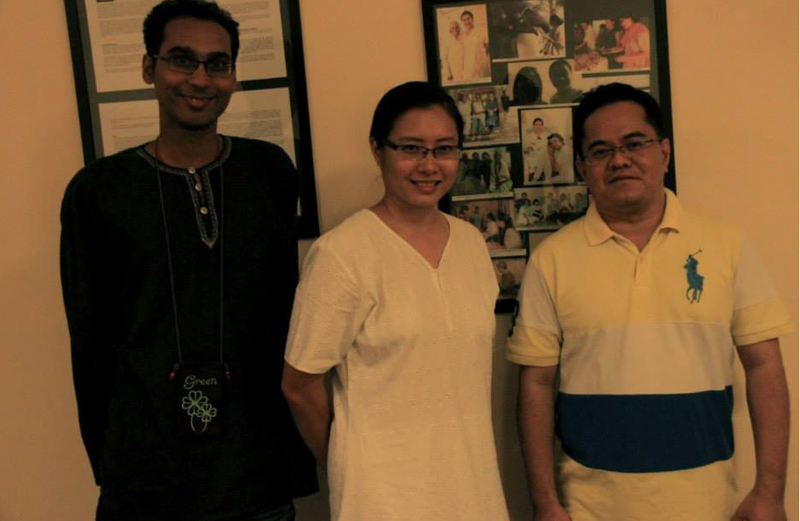 (hla) Last month (October) on the 7th, a workshop on Discovering Vibrational Medicine was organised by the Sandhya Maarga Holistic Living Academy at the Sandhya Maarga Holistic Wellness Centre. 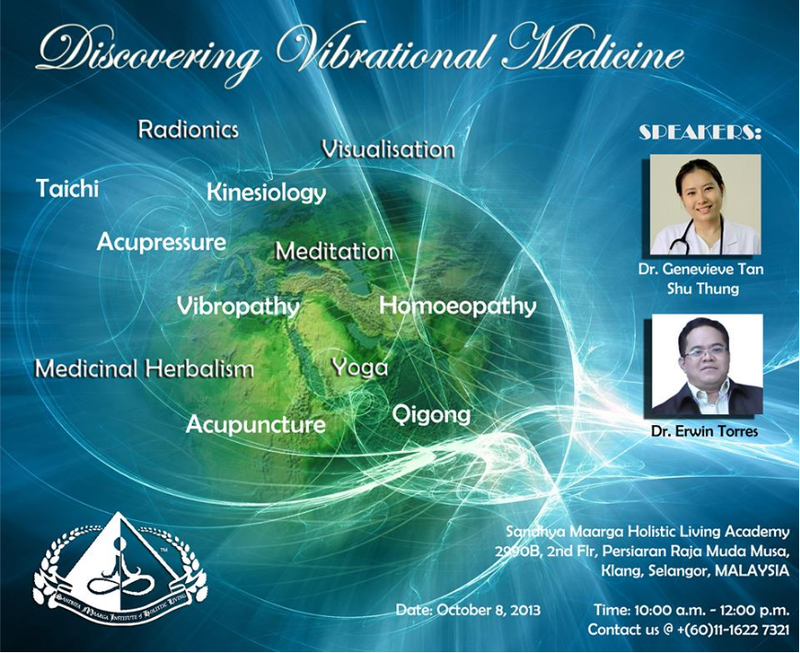 Three speakers, Dr. Genevieve Tan Shu Thung, Dr. Erwin Torres and Silambarasu Karuppiah, conducted the workshop to educate the public on the position and effectiveness of vibrational medicine in society today. The lecture began with Dr. Genevieve Tan Shu Thung, Sandhya Maarga's meditation and Yoga Master, introducing the principles and philosophy of Complementary and Alternative Medicines (CAM) as well as how mind-body medicine works. She explained to all participants about the subtle anatomy of man and how it affects their health when the energy fields are altered. To prove the power of the subconscious mind, Dr. Genevieve engaged the audience by calling forward a volunteer to grasp 2 pieces of paper (with words written on them - unknown to the volunteer) (see picture in the above). The words were LOVE and HATE. When the participant held onto the paper with the word "HATE" written on it, she could not resist the pressure exerted on her arm. However, when she held onto the word "LOVE", the volunteer could easily resist the pressure exerted on her arm. This, according to Genevieve, who is also an author and strong proponent of the mind-body medicine field, is the evidence that there is no boundary to the subconscious mind. The result of the experiment pointed positively to the realm of mind-body medicine. Continuing the workshop was Mr. Silambarasu Karuppiah, a pharmacist from Hospital Kuala Lumpur, who educated the participants on the role and side-effects of pharmaceutical drugs. He highlighted various important points on how dangerous it can be to rely on pharmaceutical drugs, and how important it is to strictly follow one's medical prescription and the consequences if one does not. According to him, while CAM offers a good and viable service to promote natural healing, western medicine is also equally important especially when it comes to medical emergencies. The 28-year-old pharmacist also mentioned how microorganisms develop resistance to antibiotics due to the misuse of the drug. "This can definitely pose danger, not only for the current patients but also for the future generations as resistance cannot be undone. It can take very long before the pharmaceutical industry can develop newer forms of antibiotics to fight off certain illnesses," said Silambarasu. 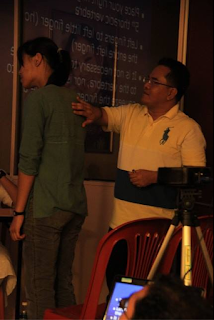 The third part of the workshop was Dr. Erwin Torres' presentation on the Kinesiology technique, another form of complementary therapy, which combines gentle, muscle-testing techniques with Chinese Medicine principles, western science, counselling and energetic science. Dr. Torres demonstrated how Kinesiology could be used to relieve conditions resulted from burns, bleeding, choking and pain. Dr. Torres, who flew in from the Philippines, also mentioned that Kinesiology is highly effective for hiccups. One need not drink any glass of water to get rid of hiccups but just fold one's arms around the chest area. Several participants managed to put the technique to the test and are now convinced that Kinesiology is in fact, real Science. "When I felt the first hiccup, I just simply crossed my arms and waited. It just vanished," said one of the workshop participants. The lectures concluded with a whole body quantum diagnosis using a specific device. The participants' energy fields were measured, which results were then linked to certain bodily conditions. Dr. Genevieve Tan Shu Thung and Dr. Erwin Torres will presenting at the annual conference of the Philippines College for the Advancement in Medicine Foundation from November 9th to 12th, 2013. It will be conducted at the Club Filipino in Greenhills, San Juan City. Members of the Sandhya Maarga Yoga group will also be presenting another Yoga workshop on "Yoga & Weight Loss" on November 13th at the Inglesia in the Cristo Gymnasium (Philippines).